There are lots of opportunities to volunteer at Doheny State Beach, for both one day events and longer term commitments. Check out our website’s calendar of events and/or our e-newlsetter, The Doheny UPDATE for currently scheduled events. 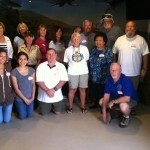 For more information, contact DSBIA Volunteer Coordinator Kathy Wade at volunteer@dohenystatebeach.org. SHOPPING EXTRAVAGANZA AT THE OUTS AT SAN CLEMENTE! BEACH AND PARK CLEAN UPS: There are numerous beach and park clean ups during the year. February is “Love Your Beach Clean Up,” April has “Earth Day”, July has”July 5th Extravaganza Clean Up “and November is “Give Thanks to the Ocean Clean Up”. These events are held between 9 AM to Noon on Saturdays and are coordinated by our Park Nature Interpreter Vicki Wiker. Participants are encouraged to bring gloves and recyclable or biodegradable bags (paper grocery bags are great). We usually rally up to start the event by the Lifeguard Headquarters by San Juan Creek on Doheny’s main beach. These are great activities for individuals, family and friend groups and organized groups such as Boy Scouts, Girl Scouts, schools, other youth groups and community service organizations. Look for the next Clean Up on our home page or in The Doheny UPDATE. 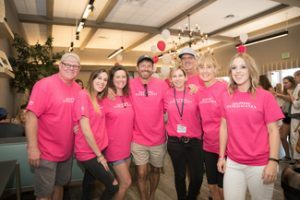 SPECIAL EVENT VOLUNTEERS: Special events such as The Doheny Blues Festival, the Driftwood Concert, the Saboso Craft Beer, Tacos and Music Festival, the Doheny Surf and Art Festival , San Clemente Outlets Shopping Extravaganza Day, and the Pacific Paddle Games ask for volunteers every year. For many of these events, volunteers receive free entry to events once their volunteer shift is done or other gifts for their service. Those volunteering to work in beer gardens or other sites where they will be serving alcoholic beverages will need to have a current California Level 1 Server / Seller Certification. This can be earned in an on-line course, such as at http://www.sellerserver.com/California/level1.html , There is a $25 fee for the course which will be reimbursed to you by DSBIA once the course is completed and you have volunteered for one event. NATIVE PLANTS PLANTING DAY: At least once a year, and sometimes more often, Park Nature Interpreter Vicki Wiker organizes a Saturday when she and volunteers will clean up and replant native species of plants in various areas of the park. This is a fun, “get your hands dirty” activity that includes learning about native California species and the proper way to plant flora. A Native Plants Planting Day is usually scheduled for a Saturday before or after California Earth Day in April. Look for it on our website’s calendar or in The Doheny UPDATE. PAINT AND REPAINT WHALES ON THE WHALE WALK. During the Festival of Whales, held in March, DSBIA repaints a few of our whales on the Whale Walk and may paint a new member of the pod. Volunteers are welcome to come add their brush strokes to the project. Our call for painters will appear on our website and in the Doheny UPDATE a few months before the event.